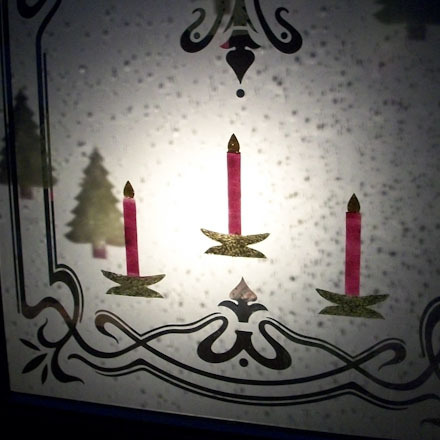 Decorate your windows in festive and colorful holiday designs with simple paper stencils. 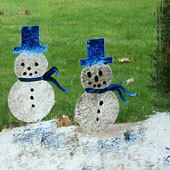 Make snowman, bell, angel, star, candle or Christmas tree stencils to use with Aunt Annie's special paint mix. 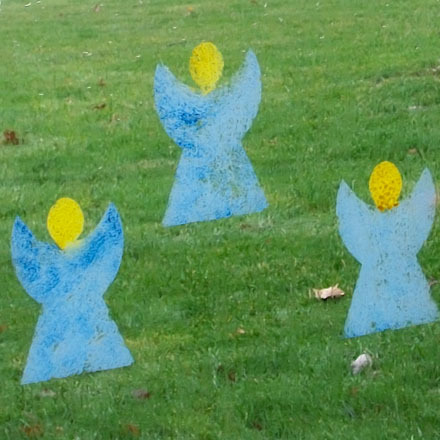 The stencils are easy to make and use, and the paint will wash off the windows with ease at the end of the holiday season. 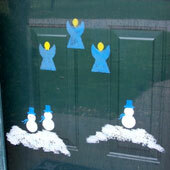 Related craft: For winter-time fun, stencil snowflakes on windows. Choose the stencils you want to use. Download and print the pattern. 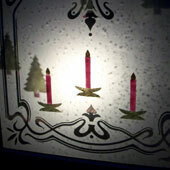 There are three sets of festive window stencils from which to choose. 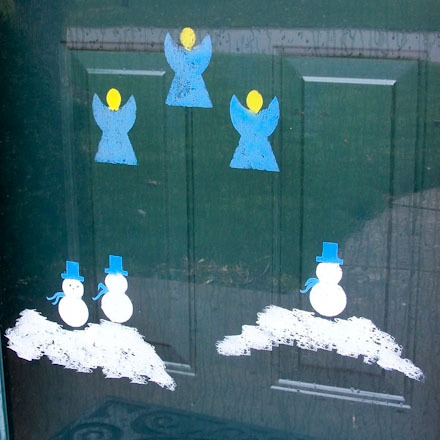 The first set includes a snowman, an angel, a plain bell, and a bell with a ribbon. The second set has a Christmas tree, a candle, a five-pointed star, and a six-pointed star. 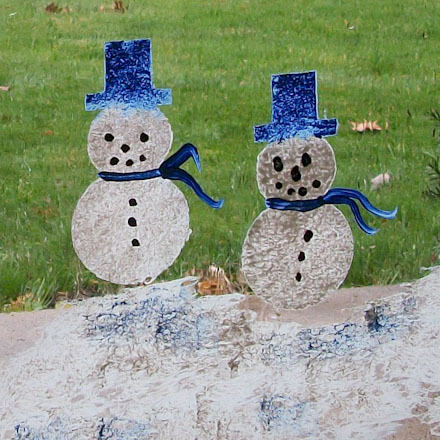 The third set has snowman and matching scarf stencils in two sizes along with a scarf stencil for the snowman from the first set. 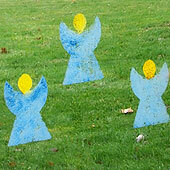 The fourth set has larger versions of the Christmas tree and angel stencils. Tip: For small children, pick the first set and have them make the plain bell. Cut out the rectangle around each stencil. Be sure to make the cuts straight and the corners square. Fold the rectangle in half on the dashed line. Be sure that the printed stencil design is on the outside. Cut the stencil on the pattern lines. Remember, you are cutting away the center. Be careful not to cut through the frame of the stencil. Carefully unfold the paper and flatten the crease with your fingers. Save the cutout. It can be colored and glued to a card, a placemat, or even made into an ornament. Spread newspapers under the window you plan to decorate. This will protect the floor from any spills or drips. Clean the window with a spray cleaner and let the glass dry. Pour a small amount of water-based paint onto the plastic lid. Add a few drops of dishwashing detergent, and mix using a paintbrush or a toothpick. Poster paints and acrylic paints work well. Place the stencil on the window where you want the design to be. Hold the stencil in place with masking tape on each corner. With a sponge piece, apply the paint mixture to the stencil—use just a little paint at a time. Apply the paint using an up-and-down dabbing motion. This is called stippling. Be sure to cover the entire cut-out area of the stencil with paint, but don't go outside of the frame. Loosen the tape and pull the stencil straight off. Let the paint dry before doing the next stencil on this window. Tips: After the paint has dried, use a small paintbrush to add details to your stenciled design. 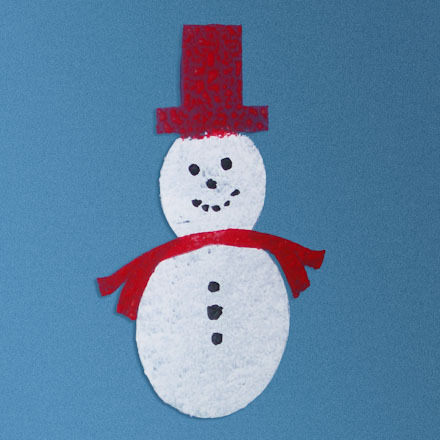 Try things like adding a face to the snowman, or a ribbon to the bell. You might also apply two or more colors to one stencil. You could stipple the candle's flame with yellow, the candle with red, and the candle holder with white. Use your imagination and see what you can create! When you are done with all of the stencils, wash the sponge, paintbrush, and lid with warm water. Pick up the newspapers protecting the floor and discard them. Now that you are done, stand back and admire your work. Don't forget to look at the stenciled designs from outside, and especially enjoy how they look at night with a light shining in the window and the drapes closed. Tip: Stencil with two or more colors. 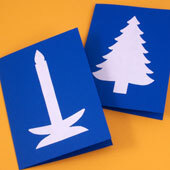 Tip: Use a paintbrush to add details to stenciled images. 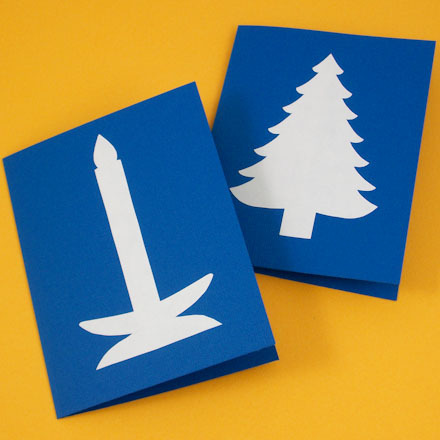 Tip: Save the stencil cutouts and use them to decorate greeting cards. Tip: See how the stenciled designs look at night with light shining through them. 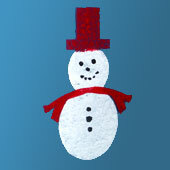 Tip: Stencil the scarf (Set #3) on the snowman after the snowman's paint has dried.